Bram Stoker is managing a theatre with his friend the great actor Henry Irving. He’s also writing, though getting more and more frustrated by his inability to write the story that will make him immortal in the eyes of those who understand that words have power. Until one night, on his way home, he saves a woman who attempts to drown herself—and gets unwittingly drawn into the path of evil. Stoker. The Titanic. Egyptology. Mummies, and curses, and Dracula. It’s quite the combination of elements to put in one book, and yet—somehow—Robert Masello makes it work, while still keeping the historical aspects reasonably accurate in a fictional story. To be honest, it was the idea of those diverse pieces fitting together that drew me to the story in the first place. The story is primarily set in Victorian London, though it opens in the Carpathian mountains. Within the city, we visit a theatre, a grand home, a mission for the poor, and the sewers (more than once). The descriptions of all, as well as the side descriptions of Egypt, are quite vivid and make all the locations (none of which I’ve ever been to) quite easy to imagine. I cannot imagine what it would be like writing a book based on historical figures but adding in the fantastical. It’s hard to say what they may have said or done when these events are dropped in their laps—and yet, if it feels at all unrealistic, readers will be turned off immediately. Masello walks that fine line with ease here, and I quite enjoyed how he portrayed the characters. Mina, the independent adventurer who is unwittingly the start of so much of the insanity that followed. Bartholomew Thorne and his sister Winifred, the wealthy benefactors of the mission who have so many secrets to hide. Stoker, trying hard to come up with a story that will cement his place in history. All of them fit within their parameters, and yet were not quite what so many might imagine. Stoker did, eventually, cement his place in history when he wrote Dracula. The Night Crossing argues that it was based—at least in part—on the real-life fascination with Egyptology and the arcane that swept Europe during this time. While it does have fantastical elements within it, it reads less like a fast-paced, contemporary urban fantasy, and more like Dracula itself, the slower build to the final denouement. It’s quite well done, and really has the effect of making the story more believable in that fine line it was walking between historical accuracy and a tale that swirls around ghosts and mummies and a long-dead author. 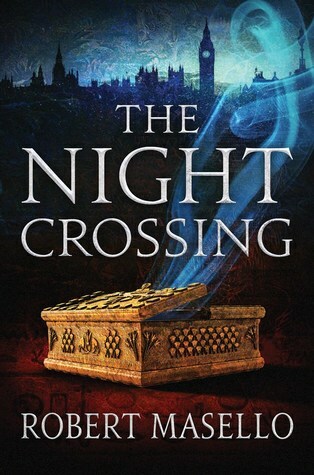 The Night Crossing is just a really good story—one of strange, seemingly disparate, pieces that all join together into a whole that is classically written and interesting to behold. I’ve never read any of Masello’s works before, but I feel like I should change that. There is certainly something to be said for a slow-burn classical tale that twists and turns into places you can’t quite see coming. As a bonus? If you buy the hardcover version it is STUNNING. The dust jacket is lovely, yes—but the actual hardcover is gorgeous. Front and back design, and well worth purchasing for your shelves!